Mustad Southern + Tuna forged, knife edge point,brazed,ringed,tinned hi carbon steel fishing hooks. Premium Mustad Big Game 7691 Southern Tuna Style hooks for the serious big game fisherman! These are a Southern Tuna style hook which can be used for both Bait fishing the larger baits from Mackerel to Yellowfin Tuna for the larger Marlins, Tunas, Sharks, Swordfish, or rigging your favorite lures. 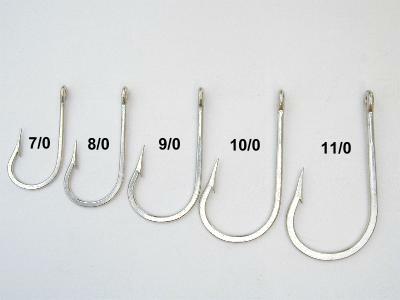 These are the preferred style of hooks for most professional captains world wide! You gotta have some of these in the tackle box or on the boat "Just in case you see the catch of your dreams just waiting for you to throw a bait to it". 5 PCS OF SIZE 10/0 . 4 PCS OF SIZE 11/0 .